Hunt Arizona Mule Deer with Big Chino Guide Service. Our team has 30 years experience chasing high caliber bucks in the lands of Arizona. 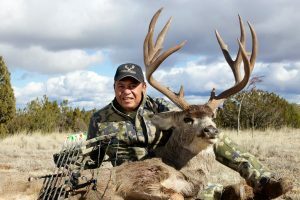 Over the Counter Archery Mule Deer Hunts in Arizona are the most overlooked in the west with opportunity at trophy caliber bucks with an average 160 – 180 class bucks, with annual bucks exceeding 180+.